Once your child has mastered Counting Numbers, it is time gain some basic Math skills. These skills are needed so your child can play around with numbers and find them meaningful. More complex skills like addition, multiplication or fractions have their own topic. A number line is a very useful tool. It shows numbers arranged in a line. By writing out numbers this way, it is easier for your child to see how numbers relate to each other. It also reinforces the Counting Numbers. Experiment with drawing number lines with your child. Add them to your Math reference file so your child can refer to them while doing homework. Remember that a number line is a continuous line, that is, it has no end since numbers can go on indefinitely. A number line teaches the concept that numbers occur in a fixed pattern, not randomly. This means that the order of numbers never change. A six always follows a five, ten always goes after nine, and so on. Patterns occur in many areas of Math. For instance, multiplication and division have their own patterns. There are patterns in problem sums as well. Searching for patterns also trains your child's brain and helps her think logically. A number line makes it easier to learn basic Math skills like arranging numbers in ascending or descending order, comparing numbers or adding and subtracting numbers. skills which will help your child develop Number Sense and build a solid Math foundation. I think it is important to introduce basic Math terms to your child as early as possible so he gets used to them. Consecutive numbers are numbers that occur in their proper order. For example, 8, 9, 10 are consecutive numbers but 3, 7, 2 are just three numbers. There are also consecutive even numbers and consecutive odd numbers. Children do a lot of written work in school. So during practice, give your child objects that she can hold and manipulate for her to develop a deeper understanding of Math concepts. 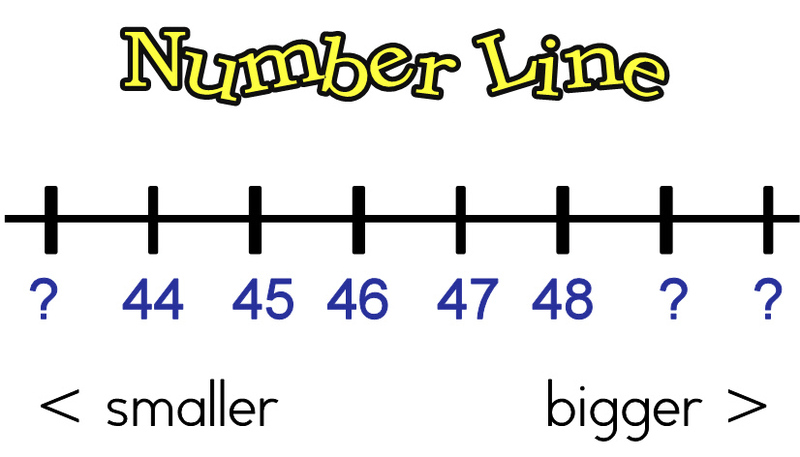 Here are some ideas to help your child understand about number line and number order. Start with some consecutive numbers. Use the numbers that you've cut out earlier, or write your own numbers on blank business name cards to create a number line. Jumble up the numbers, then let your child arrange them in a line. Instead of figures, you can also use number words or picture cards. A number line is also good for teaching ordinal numbers like "first", "second", "third" and so on. Ordinal numbers can be counted either from the left or from the right. 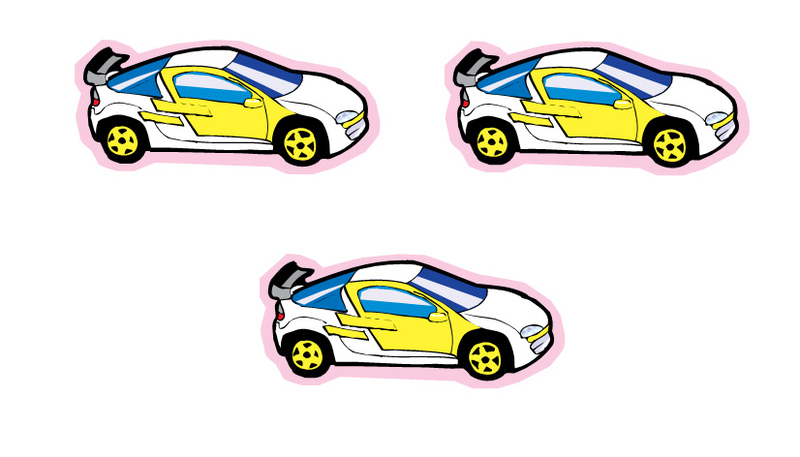 Line up your child's toys and ask questions like "Which toy is third from the right?". This exercise also helps your child remember which is his left hand and right hand. At the supermarket or library you can ask your child to "Bring me the fifth bottle/book from the right." Build up your child's confidence and help him feel capable of understanding basic Math by letting him test you. Give some wrong answers to see if he catches them. 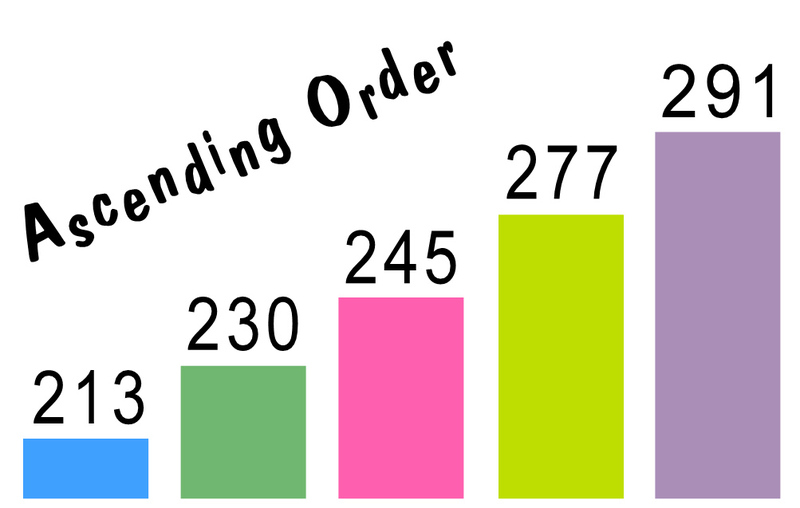 Introduce the terms "Ascending Order" and "Descending Order" when teaching the Math skill of ordering numbers (arranging numbers in a particular sequence). Ascending Order means arranging the numbers from smallest to biggest. Descending Order is the opposite: arranging the numbers from biggest to smallest. After your child is familiar with ordering consecutive numbers, you can use random numbers. For example, take any 5 numbers between 30 and 50 and ask your child to arrange them in ascending or descending order. Remember to refer to a number line if necessary. Even after your child has mastered arranging small numbers in order, he might get confused with numbers in the hundreds or even bigger. This is where a number line really helps. Here are some ideas for games that you can play with family and friends to reinforce the Math skill of ordering numbers. Everyone must arrange their numbers in ascending order as quickly as possible. The first person to finish wins. Play a few rounds and give out points to find the final winner. 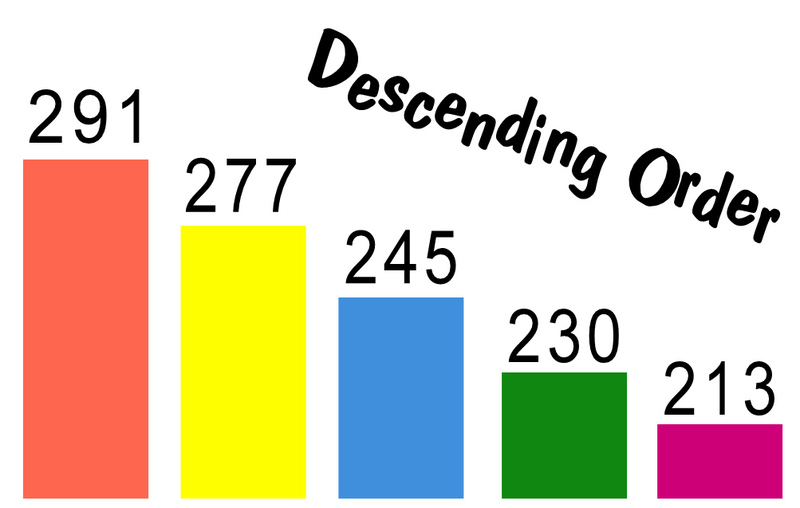 Remember to practice both ascending and descending order. Here is a fun outdoor game. Form players into teams. Pin a number to the back of the players' tee shirts (they are not allowed to look at each other's numbers). At the start signal, the players must line up with their numbers in order. This is fun because they cannot see their own number so must depend on their team members to guide them. Players must line up with the numbers facing the judge. The first team to line up correctly is the winner. This game is good for practicing ordering bigger numbers (hundreds or thousands). Or for confusing numbers like 1011 and 1101. Comparing numbers is another super important Math skill your child must know. Without it, your child will struggle to do problem sums. Even in the simplest problem sum, your child will need to know how to compare numbers. Some Math terms which rely on knowing this skill include "more than", "twice as many" or "half as much as". Start by drawing a number line of about 15 consecutive numbers. You and your child each choose a number. Refer to the positions of the numbers chosen to write a 'bigger than' and a 'smaller than' sentence about the numbers. Point out the fact that numbers to the right are bigger than numbers to the left. Similarly, numbers to the left are smaller than numbers to the right. You can also introduce the symbol for bigger than (>) or smaller than (<). The way to remember how to use this symbol is to write the smaller number at the closed end of the sign and then read it from left to right. 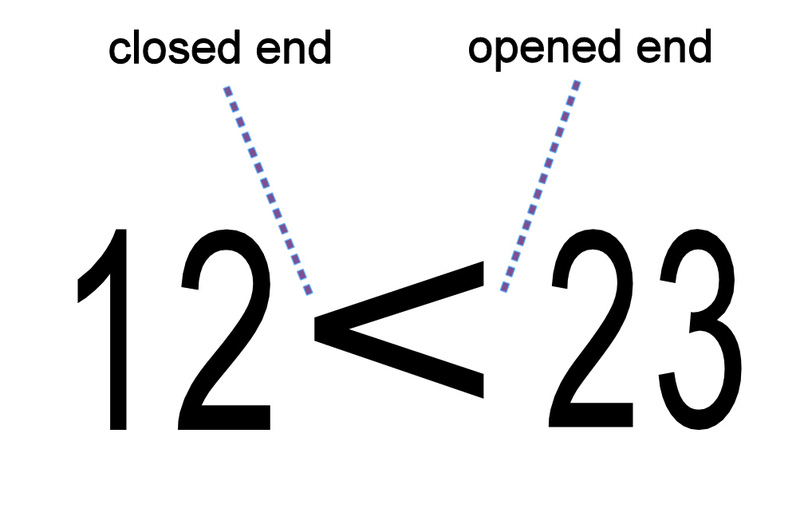 Example: 12 < 23 is read as 12 is smaller than 23. Use these Fun Math cards to discuss more about numbers. 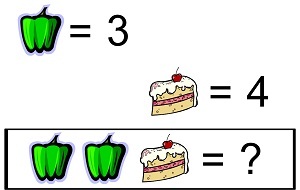 Using symbols and signs or pictures helps to develop Algebraic Thinking, which is also very important in Math. It helps your child understand that numbers or ideas can be represented by pictures, signs and symbols.